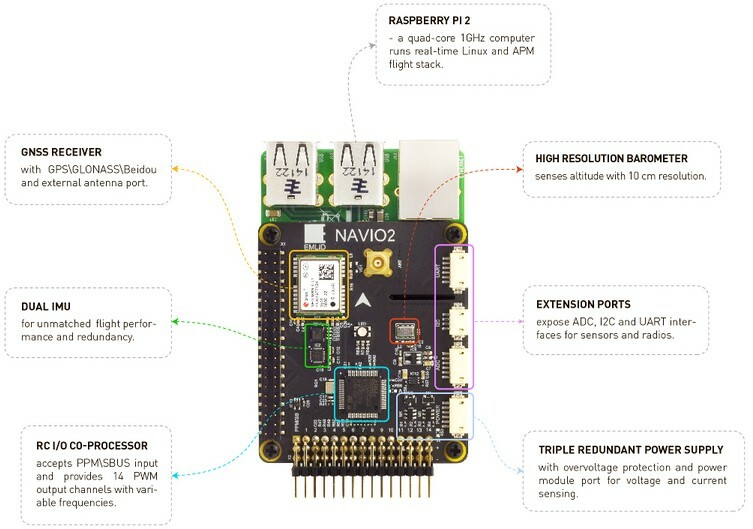 This page presents Navio2 - Raspberry Pi autopilot, which runs well proven ArduPilot flight stack and supports all its features. Dual IMU. Navio2 has two IMU chips to improve flight experience and for redundancy. Improved MS5611 performance. Transactions from other chips on the bus, which MS5611 is connected to, can produce noise during the conversion. That’s why MS5611 was left the only sensor on the I2C bus to overcome this. PCA9685 PWM generator replaced with a microcontroller. On previous Navio version PWM generation was handled by PCA9685 chip. Main limitation of this chip is the inability to control frequencies for separate channels. This leads to problems with motors and servos that work on different frequencies. To eliminate that problem a microcontroller is used. It allows to set frequencies for output channels by groups. PPM/SBUS decoding done by microcontroller instead of DMA. Navio+ used DMA to sample PPM signal which was quite heavy on system resources. On Navio2 a microcontroller handles PPM/SBUS sampling leaving processor cores of Raspberry Pi 2 for your tasks. AUX SPI. Navio2 is the first HAT to utilize AUX SPI controller on Raspberry Pi. Using two SPI controllers allows to distribute sensors more efficiently.